Donald E. Smith, ca. 1970. Dumbarton Oaks Archives (AR.PH.Misc,360.[Neg.]). 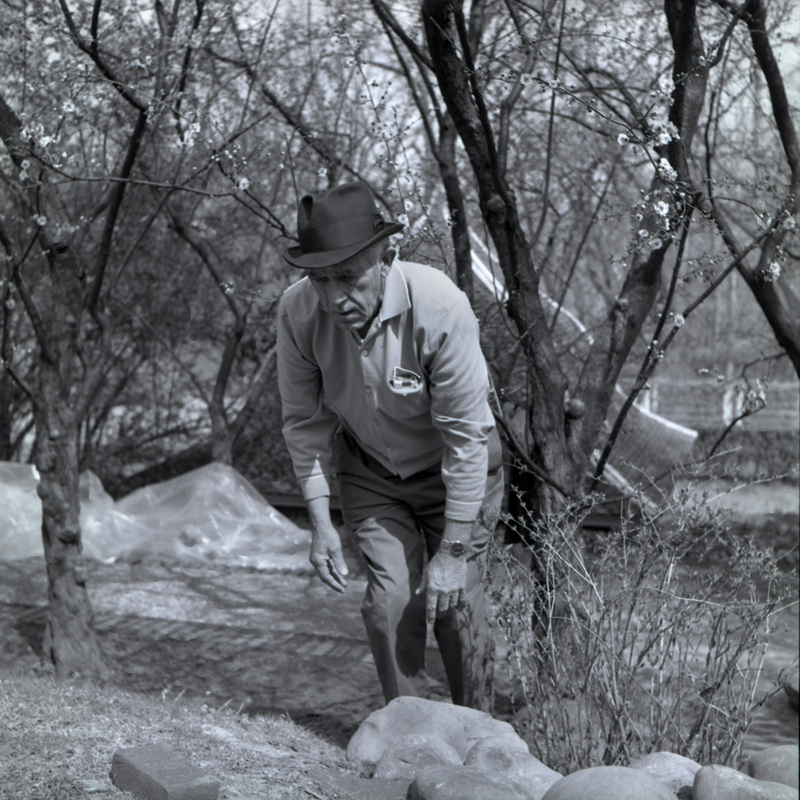 Richard Amt, staff photographer at Dumbarton Oaks between 1963 and 1974, recently donated to the Archives fourteen photograph negatives of gardeners working in the Dumbarton Oaks Gardens. Among these images are several of Matthew Kearney, Superintendent of Gardens and Grounds, and his assistant superintendent, Donald Smith. Amt employed a square format for these images and used both Agfa and Kodak black-and-white film stock. Amt had been an aerial photographer during his four years in the U.S. Air Force and then became a photograph technician for The Johns Hopkins University Applied Physics Laboratory. He joined Dumbarton Oaks in 1964 as staff photographer at the time a darkroom and studio had been equipped in the basement of the newly completed Pre-Columbian pavilion. In 1974, he moved to the National Gallery of Art as staff photographer, where he remained for twenty years, becoming chief of photographic services during his last nine years there. Matthew Kearney, ca. 1970. Dumbarton Oaks Archives, AR.PH.Misc.365.(Neg). Matt Kearney (1909–1973) was born in Ireland. After immigrating to the United States, he began a career as a gardener. Mildred and Robert Woods Bliss hired Kearney in 1930, and he worked under the Blisses’ garden superintendent, William Gray, and later, beginning in 1937, under superintendent James Bryce. In 1948, he took over as Superintendent of Gardens and remained in charge of the gardens until his death. As a young man, Don Smith (1928–2012) had worked for Beatrix Farrand at her estate Reef Point in Bar Harbor, Maine, before receiving a degree in horticulture from the University of Maine, Orono. At Dumbarton Oaks, he served as Assistant Superintendent of Gardens and Grounds (1952–1974) and then as Superintendent of Gardens and Grounds until his retirement in 1992.